If you are married, having a date night with your spouse is so vital to keeping the excitement alive in your marriage, but finding the time isn’t always easy. 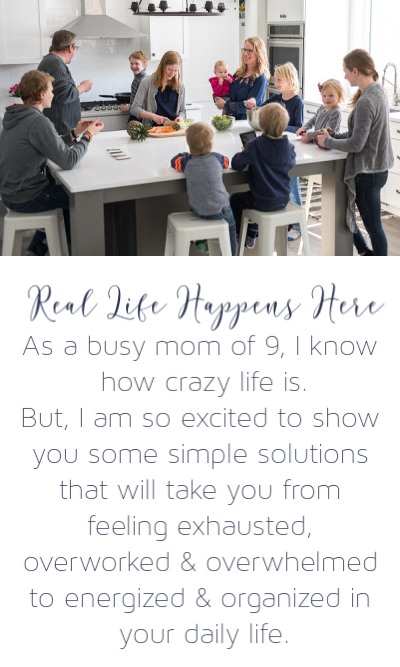 With eight kids, two working parents, and other responsibilities, I know firsthand that the struggle is real for my husband and I. In fact, date nights for parents can be unheard of. But with some creative ideas on how to make it happen and even some really fun date night ideas like I shared HERE, you and your spouse can steal a bit of time away. Heading out on a date? Be sure to grab our free date night conversation starters worksheet that you can print off and take with you. Enter your email below for instant access! 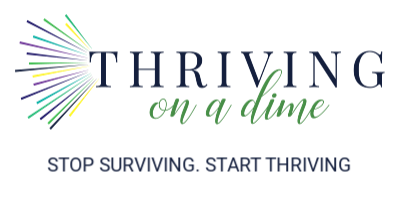 We certainly know that we need to make spending time as a couple a priority, even if having a date night in, but with a bustling family life I certainly know how difficult it can be. With this in mind, I’ve got 10 secret creative ideas to making a regular date night a priority in your marriage. We all know that if something like this is planned, somehow life manages to get in the way most times…at least if your life is like mine. It is so easy to push these plans off to the side when something more urgent comes along. 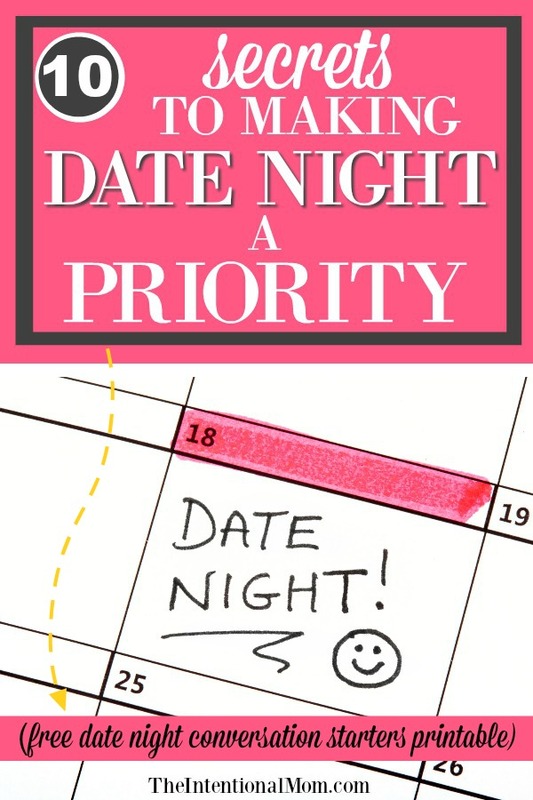 While there is a time and a place for truly urgent circumstances to take priority, you need to set yourself up for the greatest likelihood of having a date night by putting it on the calendar. This means the calendar that each of you uses whether they are the same or different. This is especially necessary if you will be needing a babysitter. I can speak to this from the other side, which is that my girls who regularly babysit can rarely accommodate a last minute request. Teens these days are incredibly busy, I think more than I ever was. So planning in advance is necessary when dealing with a babysitter. Beyond a babysitter, planing in advance allows for other events to be scheduled around your date night. When it is on the calendar, you have each committed to making this a priority. And, you will also have time to plan for some fun and creative ideas. In all honesty, is there anything more annoyingly stressful than you each getting in the car, sitting there, and each asking, “What do you want to do?” Then it continues…”I don’t know, what do you want to do? !” On and on it goes. Without a plan, you can waste the first 20 minutes figuring out what to do while getting increasingly more frustrated with one another. Know ahead of time what you are doing, make sure you are both aware, and avoid the unnecessary aimless driving around and growing frustration that comes with having no plan. Even if you are staying in, look nice. Make some effort to look nice for your husband. This is keeping in line with the thinking that you want to look the part. You want to have a nice evening, so look like you are ready to have a nice evening. Even if you are just having a date night at home, resist the urge to get changed into your pajamas. Pj’s are comfy, yes, but screaming of date night, no. When it comes to a date night, you don’t have to be fancy, but you want to look nice. If you are like me, this might be the only time you are wearing clothes that don’t have someone’s food splattered all over them! Parents deserve to look nice and to have some fun, too. This is not the time to discuss your complaints or grievances with one another. This is not the time to talk about problems with your finances, your family members, or any other subject that has a negative feel to it. There is certainly a time to discuss these, but it isn’t while on a date. You will need to schedule another time to deal with these sorts of matters. Just like in the example above, there is another time to deal with these matters. While the kids may comprise the majority of your life, it is important for you to have a break from them. A date night provides you with the perfect opportunity to do that. A date night is an opportunity for the two of you to focus on one another and to connect again. You probably went on some dates while you were dating. And, you were most likely not discussing the kids. Pretend you’re teens again. And then, talk about that fun stuff! If you have a time on the calendar to discuss these things, it will be easier for you to push these matters aside while on your date. For instance, my husband and I will have planning or brainstorming sessions on Sunday evenings while dates generally occur on Friday nights. Both will be on the calendar nearly all the time. It is so great to have some fun together. So often you hear of couples who grow apart while they are in the thick of career building and child rearing. This is less likely to happen with couples who regularly have fun in their marriage. A date night is such an important time to have some fun together. After all, chances are that the two of you had fun together while you were dating prior to marriage. Remember, fun does not have to mean expensive! There are plenty of cheap date night ideas. I even share some cheap and free date night ideas HERE. Kids getting sick could be the exception here, but make your date a priority and keep it that way. No matter how busy you both are, resist the urge to allow something that can seem more urgent to you to creep in and take precedence over your date. If your life is anything like mine, there will always be something that can take over and derail your plans for a date night. But, if you allow this to happen, you are most certainly not making date night a priority. 10. Keep in mind that date night can occur at any time whether in the evening or during the day – get creative! So often we think of dates as a Friday night activity. When we can’t make that happen, we assume that the date cannot happen. Some of the best dates that my husband and I have had have been over lunch, on an afternoon picnic, or driving out to the beach in the morning. When life is busy, you need to go with what works. This might mean that dating at a different time of the day than what we traditionally think of will be necessary. My husband has worked plenty of different shifts over the years, too. This means that having a date at night just wasn’t possible. But, we still had plenty of fun at other times, too. Keeping the love alive in a marriage can be difficult, but having regular date nights are so important. Even if they can only occur once a month, this would still be considered a regular date and can be such an asset in your marriage. Take these 10 secrets to heart and start planning today! 25 Great Conversation Starters to Have With Your Spouse.